Bell peppers, also known as sweet peppers, offer a mild, sweet flavor and crisp, juicy flesh. They’re enjoyed raw in salads, they’re a favorite as a party platter dipper, and they can be cooked several ways: baked, braised, grilled, steamed or sautéed. Nutritionally, the bell pepper is an excellent source of vitamins A, B6 and C. And it is a very good source of fiber, folate, potassium, and vitamins K and E. It also boasts several phytonutrients, including the flavonoids luteolin, quercetin, and hesperidin, and the carotenoids alpha-caroten, beta-caroten, cryptoxanthin, lutein, and zeaxanthin. By consuming fruits and vegetables high in beta carotene you can help keep your body healthy. In the body, beta carotene is stored in the liver, and from there the body converts it into vitamin A. And beta carotene may help increase memory and protect your cells from free radical damage. All great reasons to put bell peppers on your plate! Dice bell peppers and top tacos and pizzas, slice and saute bell peppers and onions to top Italian sausages, slice bell peppers to tuck into sandwiches or wraps, or stuff bell peppers and bake for a comforting fall supper. 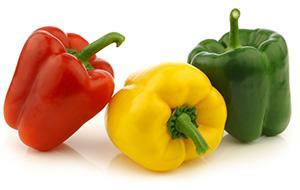 When shopping for bell peppers, choose brightly colored and heavy bell peppers that have firm, smooth skin. And when storing bell peppers, store in an open plastic bag in a refrigerator’s vegetable crisper. Stored properly, a bell pepper will last about a week. Bell peppers are available year-round but are at their peak during late summer and early fall.